80-mile (129 km) swim in Lake Powell from Bullfrog, Utah to Wahweap, Arizona - the longest known nonstop, solo, unassisted, current-neutral swim in any body of water. 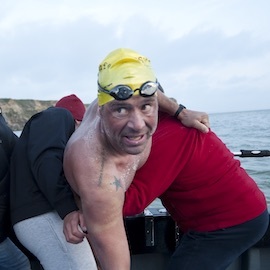 New record for earliest English Channel swim in the calendar year. 21 miles in 13 hours, 13 minutes on May 16. Previous record: Kevin Murphy (29 May 1990). Jaimie at Diane’s Rock in Lake George, NY. 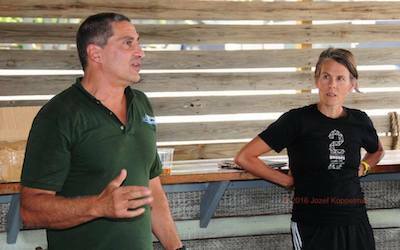 In 2016, Jaimie completed marathon swims in Lake Geneva, Switzerland (69 km, Geneva to Montreux, first to swim in both directions); Lake Como, Italy (50 km); Lake George, New York (52 km); Lago d’Orta, Italy (27 km); around Absecon Island, Atlantic City, New Jersey (30 km); around Manhattan Island (46 km); 8 Bridges, Stage #7; and the 27 km Rose Pitonof Swim in New York City. 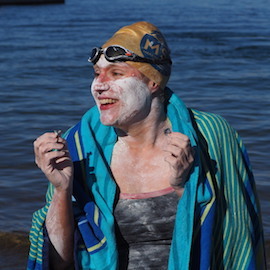 Beyond her prolific marathon swimming, Jaimie completed a 4.6-mile swim in Lake Titicaca, Bolivia, an ice mile in Iceland, and was overall winner of the International Winter Swimming Association’s World Cup. 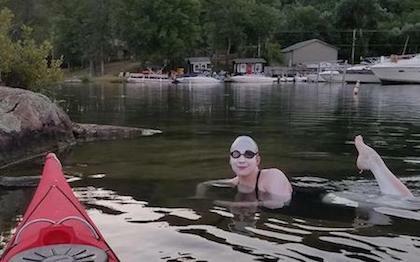 She currently serves as President of the Lake Geneva Swimming Association. 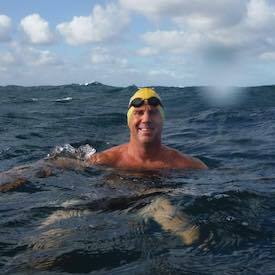 In 2016, Dan swam the Catalina Channel on January 16 (same day as the first Catalina swimmer, George Young) and the English Channel on August 25. He was coordinator and member of the “Out, Around, & Back” relay between Catalina and Santa Barbara Islands; and a member of two Catalina Channel relays, including a new CCSF-record mixed relay. 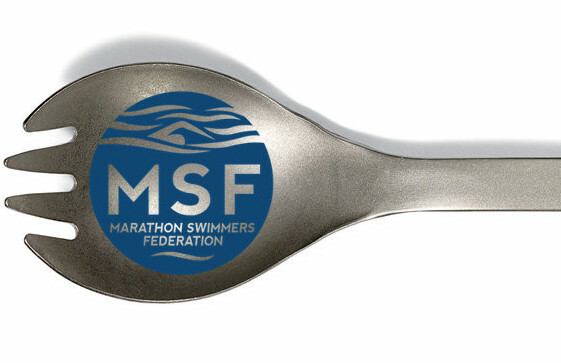 Dan has also continued his extensive work in support of fellow marathon swimmers, for which he was previously honored with the 2015 MSF Streeter Award. Among other things, he kayaked all four days of S.C.A.R. in Arizona, coached the Arch Academy Zombies team on numerous open-water relays, and coached, crewed, and observed for numerous solo swimmers and relays in channel swims around the world (details). In an administrative role, Dan serves as a voting member of IMSHOF and CCSF, and as President of the La Jolla Cove Swim Club. For founding New York Open Water and initiating 20 Bridges, a new iteration of the historically important Swim Around Manhattan. 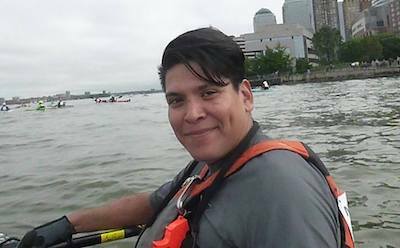 In its inaugural season, NYOW organized the 6th edition of the 8 Bridges Hudson River Swim, the 5th edition of the 2 Bridges Swim Under the Walkway 2.5K/5K, the inaugural Spuyten Duyvil 10K, and 22 solo Manhattan Island circumnavigations over three days. NYOW’s first sanctioned Manhattan swims are particularly notable, given the recent uncertainty about the swim’s future, its popularity as a leg of the Triple Crown, and the significant logistical complications in organizing such an event. Under NYOW’s leadership, marathon swimmers will be able to experience the exciting waters of New York City and the Hudson Valley for years to come. Photo of Barra and Davies by Jozef Koppelman. Circumnavigation of Bermuda Island. 36 miles (58 km) in 21 hours, 19 minutes on June 15, 2016. First woman and second overall to complete this swim, and new speed record. If you like the MSF Awards and want to support the considerable work that goes into them, consider donating. Thanks!